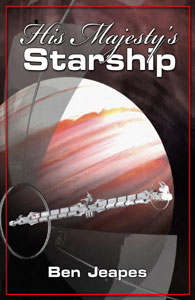 Michael Gilmore, Captain of the HMSS Ark Royal is part of Earth’s first interstellar delegation to visit an alien planet. His passengers are an ill-tempered prince and an inscrutable quadruped alien. His First Officer is on the brink of mutiny, the ship’s A.I. seems to have turned renegade, and the neighbouring vessel harbours a genocidal maniac.